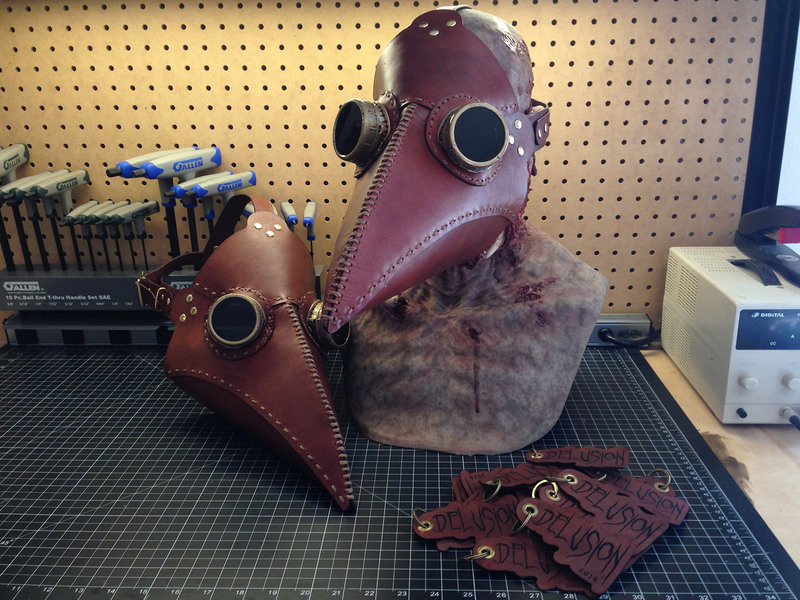 I just finished making these leather Plague Doctor masks for a client, and wanted to share the creative process with the community here. Getting to that finished product is a bit of a labor-intensive journey, so lets start at the beginning! Before moving up to expensive materials like leather, I started by prototyping the patterns in L200 foam. A similar version of this foam can be found at your local craft or fabric stores, often called "Fun Foam" or "Craft Foam." Mine started as a 4'x8' sheet from Foam Mart here in Los Angeles, and I use it for prototyping on all kinds of projects. 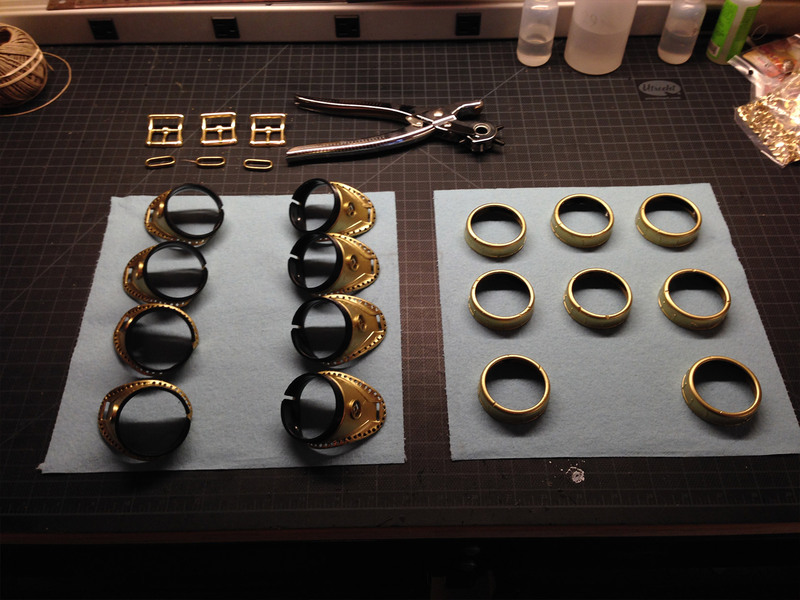 The prototypes were carefully measured and digitized. To digitize the individual pieces I photographed them over a cutting mat that has a 1"x1" grid. The photographs were then processed to remove lens distortion, flatten out the perspective, and scaled so 1 inch in the document matched the 1"x1" grid in the photograph. From there it was just a matter of carefully tracing the individual parts in Adobe Illustrator to create the paths that the laser would eventually follow when cutting out our material. Once the patterns were digitized I laser cut some test pieces out of L200 and assembled a few foam versions of the mask. These masks were then used for test fitting on various head sizes so I could determine final length for the various straps, and allowed me to make minor modifications and refinements to the patterns before moving on to leather. Cutting the leather proved a bit challenging, but eventually I was able to get everything calibrated to produce high quality pieces. To start I made a small test pattern that included all the basic elements of the mask patterns in a small 2"x2" square. Those elements include a dashed stitching line, curved lines, small holes, heavy engraving, and fine engraving. Next I cut 10+ 2"x2" squares of leather and started my tests. With each test I would fine tune the laser power, laser movement speed, number of passes to make a full cut through the leather, and engraving depth/contrast. 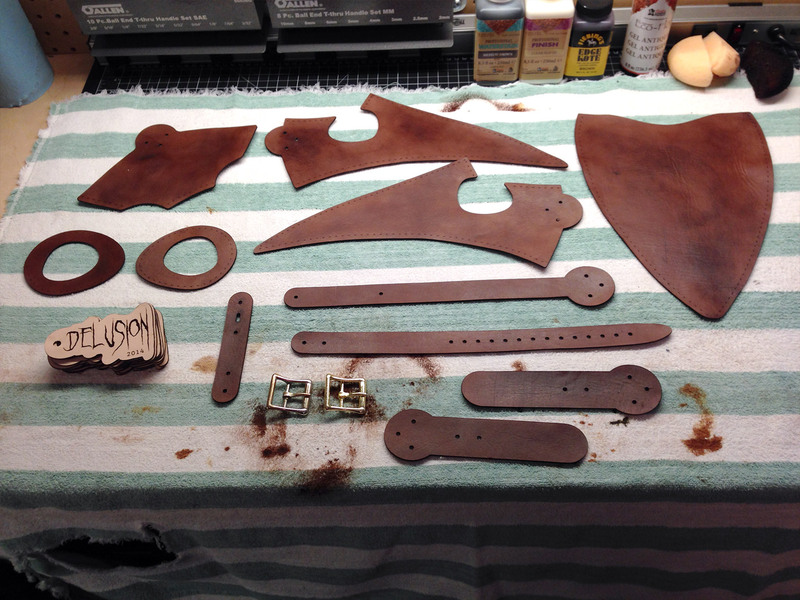 The goal is to cut the leather without burning the edges too badly. 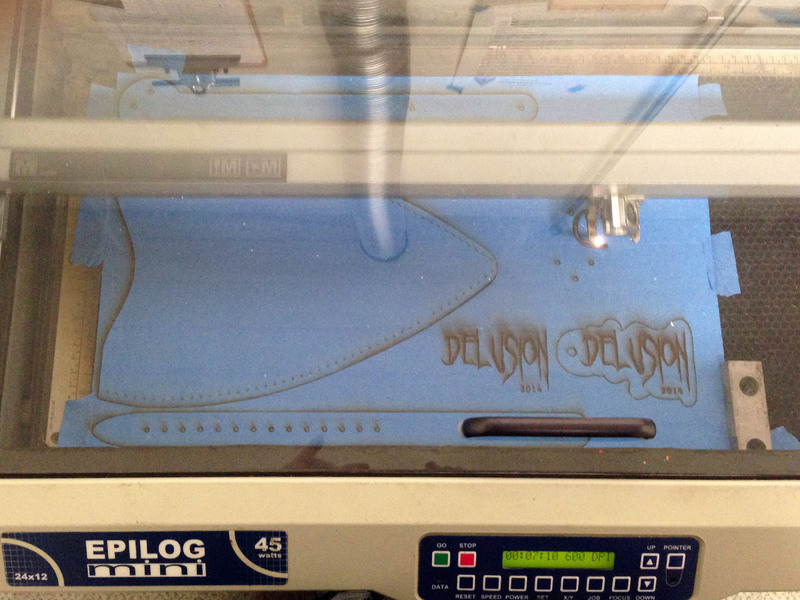 Eventually I settled on settings that required 2-3 passes of the laser to fully cut through the leather. The leather was also covered in blue masking tape to protect the surface of the leather from smoke damage. After laser cutting the leather I allowed to it to soak in a bath of warm water for a few hours to wash off the burnt edges and allow for easy removal of the masking tape. Between soakings the water was changed, and the process repeated until the water remained clear. Now that the pieces have all been cut out and cleaned, it's time to start staining. 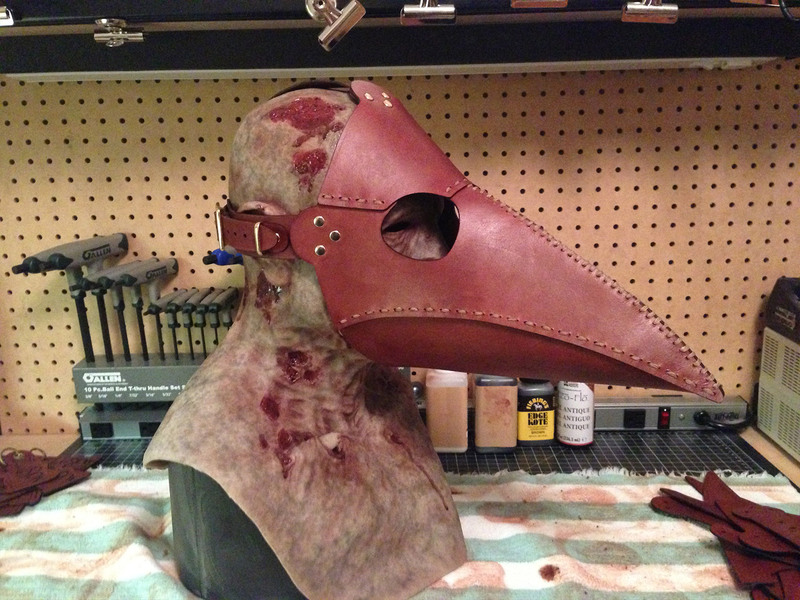 I used a medium brown water-based stain on both sides of each piece, followed buy a matte-finish water-based sealer to protect the leather and keep the stain from transferring to anyone wearing the masks. 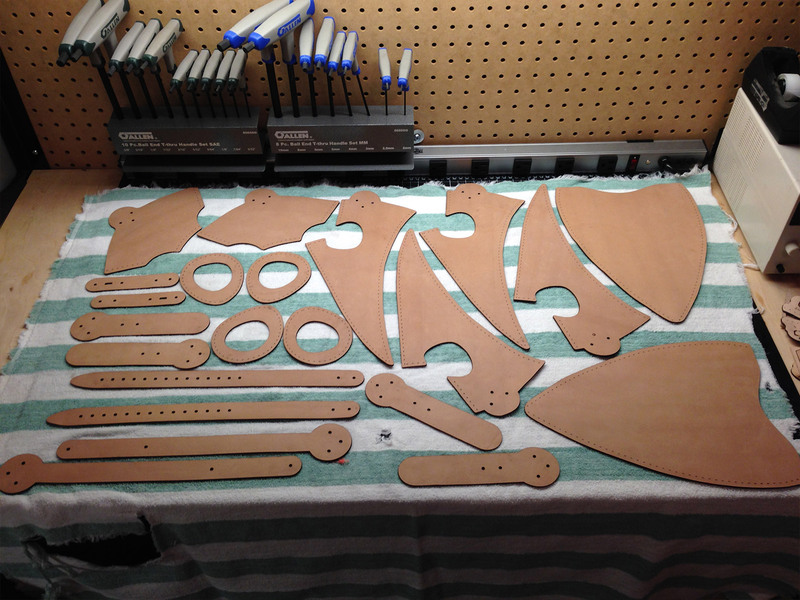 With the individual pieces all stained and sealed assembly could begin. First the edges of the mask and straps that would contact the performer's skin were rubbed with beeswax and run over with a tool called an edge-slicker. This rounds off and smooths the edges. Next the stitching holes were individually punched with an awl to temporarily expand them to allow for stitching. The holes will eventually close up and lock around the thread. Next the pieces were stitched together with a heavy waxed thread and all thread tie-off points inside the mask were protected with a dab of beeswax to prevent them from rubbing against the performer and protect them from wear. 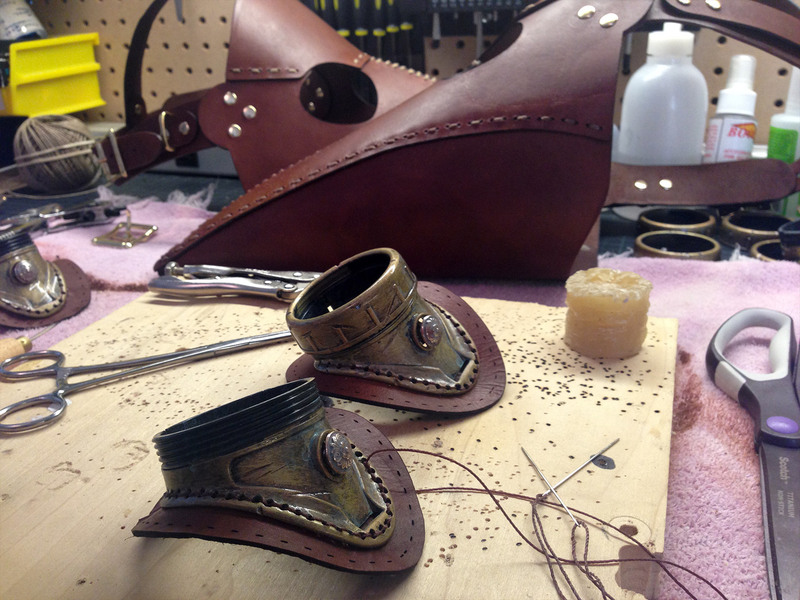 Finally the straps, complete with buckles, were riveted to the mask. 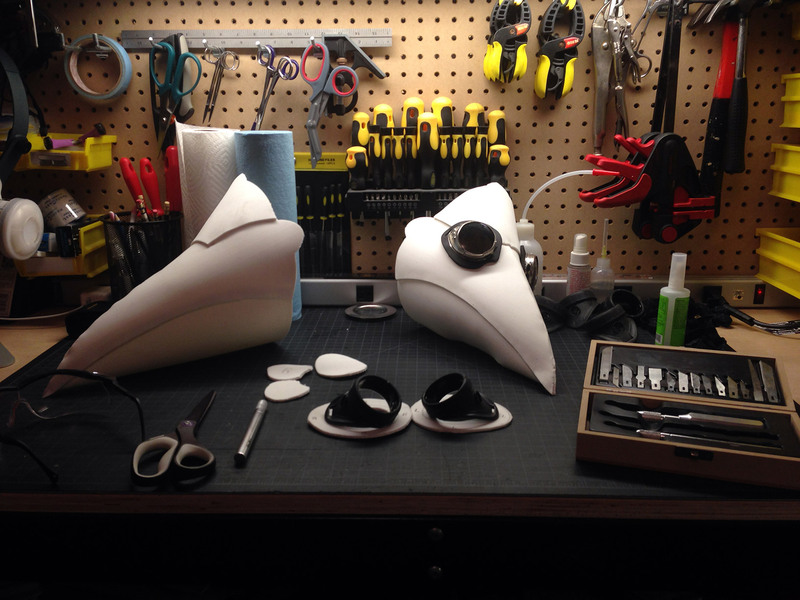 Now that the mask base is assembled it's time to start work on the goggles. I started with black plastic welding goggles and removed their straps. I also removed the circular rubber covers for the vents on the sides of the goggles. These would eventually be covered with a metal piece to add a bit of style/contrast to the goggles. Next the goggles were roughed up with wire brushes, sand paper, and files. Large gouges and scratches were added that would be accented during the weathering process. Prior to painting, small holes were drilled around the base of the goggle that would be used to stitch it to a leather ring that would in turn be stitched to the final mask. The goggles were then cleaned with acetone to remove any oils or contaminants, masked, and sprayed with 2 coats of a matte black primer designed for use on plastics. After the primer 4 layers of gold metallic paint were then sprayed onto the goggles and left to cure overnight. After the paint had cured they were hit once again with the wire brushes to add small scratches in the gold paint. Next a heavy wash of black acrylic paint was brushed onto the goggles and quickly wiped off with crumpled paper towels. This leaves dark staining in all the deep scratches and dings, and also leaves small streaks on the surface of the goggles. They instantly started looking like aged brass. Next a more watered-down wash of a reddish brown was applied, followed by multiple washes of a pale green to give the goggles a nice aged patina. The picture above shows the goggles at this point, prior to the following 2 steps that really make them pop. To make the goggles look more like real metal I dry-brushed bright gold enamel paint over the edges and high-points of the goggles to simulate metal exposed from wear and use of the goggles. 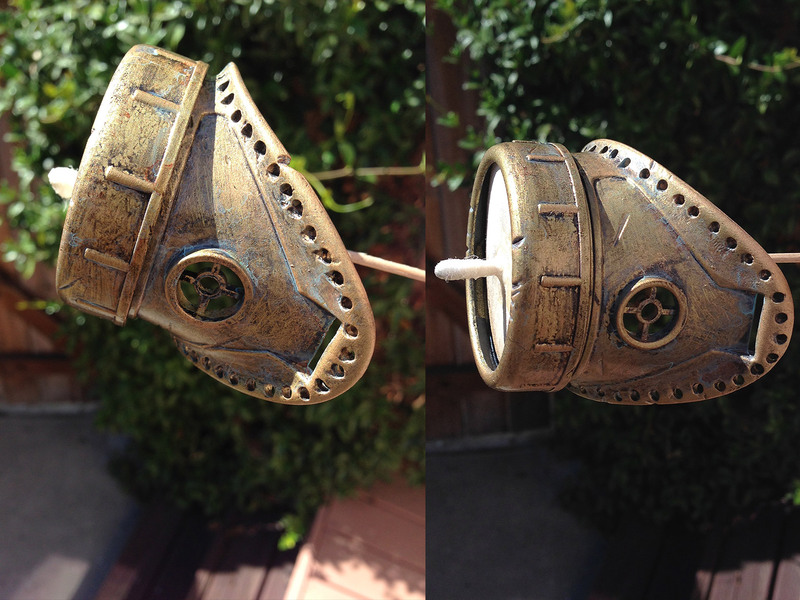 Finally the goggles were sealed with a glossy varnish that deepened the weathering and brought out the metallic qualities. After the goggles were painted I attached small metal detail pieces over the vent holes in their sides. These silver pieces were also weathered with brown and patina green washes to age them a bit. Their silver appearance provides a bit of contrast to the aged brass of the goggles, and adds a bit of style. You can also see that they still have a good gap allowing air to flow into the mask and help prevent the goggles from fogging up. Next the goggles were stitched to leather rings using a lighter weight brown waxed thread. 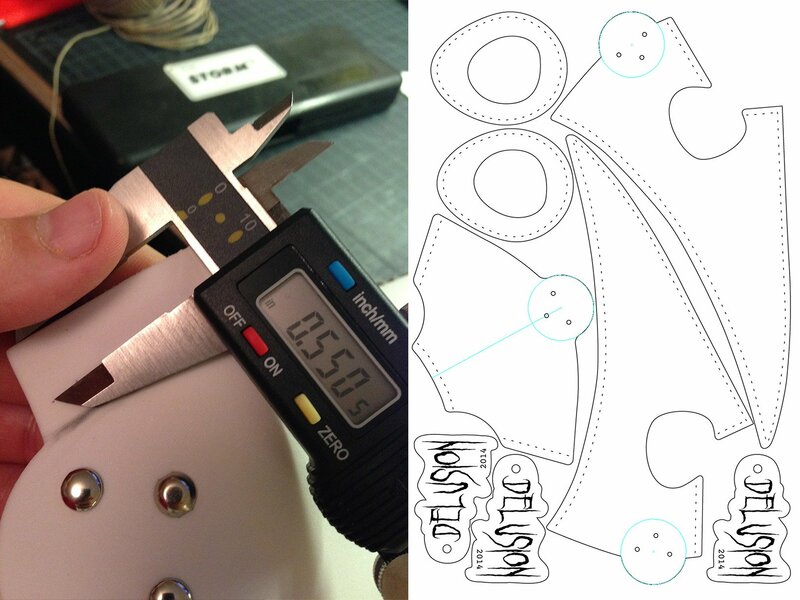 The entire goggle assembly is then stitched to the mask using the same heaver waxed thread as the rest of the mask. I also laser cut some smoked acrylic lenses that were just dark enough to make the lenses appear pitch black when the mask is being worn, but allow for great visibility even in low-light environments. And finally the masks were completed! This was an amazing project, and I'm really happy with the overall quality of the finished product. Awesome job man! I always thought those masks were creepy and cool looking (as I'm sure others do). Do you know the reasoning behind the original design? Reminds me of a Skeksis from The Dark Crystal with a Steampunk twist. Any hoo...Great work! Looks like a "new old stock" piece. Could I possibly get access to the final patterns you used, they look phenomenal! Unfortunately I can't give away the templates, as they represent a pretty big investment for me. That said, the images in this thread contain all the information you need to either exactly reproduce my templates or design your own. If you have any questions or need anything else I'm happy to help! 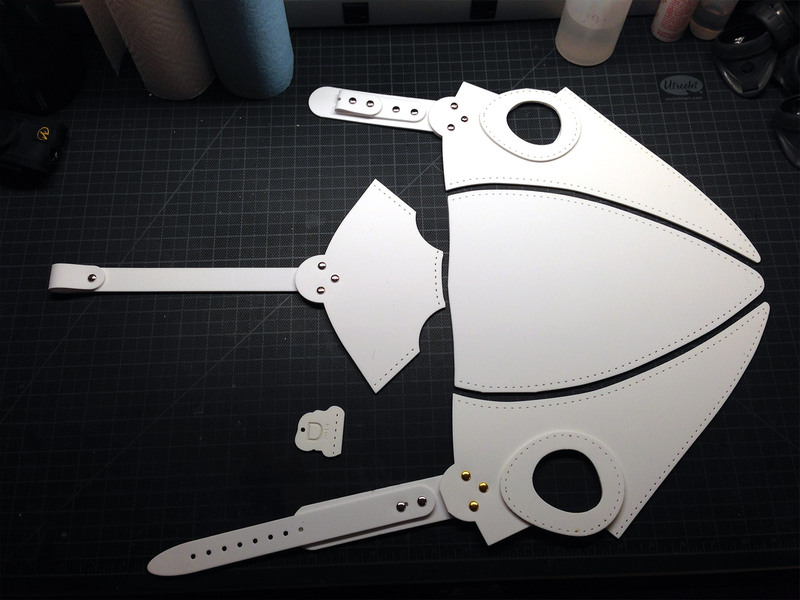 Do you ever use Worbla or Wonderflex at all for prototyping or completed articles? Many thanks for sharing your talents with us. *Chuckles* Adam - you don't need to have everything templated and given to you. It should be pretty easy to see how to do it. Firstly Chris mentions a 1" x 1" cutting board, and then he has the foam pieces lying on the board. And excellent skill to learn is "Reverse Engineering". Ok - here is how I would do it. In the picture where he has the pieces lying on the cutting board there is a smaller piece that goes over the forehead. You can guesstimate pretty accurately it's dimensions (and some of the other dimensions). Then on the photo above you have all of the pieces laid out on the foam including the piece(s) you guesstimated. Now you can print out the pattern and then scale it up to the size you want and then you have your template. Look at the "Building a T-Rex" series for scaling hints. For example - I saw someone wearing a set of stilts that I was very impressed with. However they could not give me the design. They mentioned in an article a couple of dimensions like they made your heel X number of inches off the ground. So I asked them quiet innocently "How Tall are you" and they answered..
From there I now had a scaling ruler that enabled me to calculate ALL the dimensions based on their height and the picture of them wearing the stilts. Think outside of the box, and believe that there are always solutions if you can create them. This post is from last year, and the client wass an absolutely amazing attraction called "Delusion" It's an hour long experience (this one was in an old mansion, previous one was in a massive old church) where you are led from room to room by actors as a rich interactive story unfolds. You play your part in the story by solving puzzles and interacting with both the performers and the environment. The production value of Delusion is outstanding, as it's run by a Hollywood stuntman, so his productions involve people crawling across the ceiling, dropping from 2+ stories, vanishing into thin air, etc. This year they are not doing an event as they are focusing their efforts on creating a year-round experience. I've not tried Worbla or Wonderflex yet, but I'm interested in checking those out. I do most of my prototyping for projects like this in L200 foam. I've also done a bit of prototyping in InstaMorph lately, which is an easy to use thermoplastic. So many fun materials to try out! I realy want to build one of those masks too and I already finised my pattern and I realy want to build it out of leather but I realy need to know how thick your lether is! hi. this mask is great!!! i have two questions about doctor plague mask... how thick the leather is in this mask??? the template are still top secret? I find them somewhere? Hi Rafal. Leather thickness is measured in ounces. I believe this was 6oz leather. Each ounce is roughly 1/64 of an inch thick, so 6oz leather is roughly 6/64" thick. As I do sell these masks, I can't really give out my templates. But I'm happy to provide advice, tips, and information. And this writeup has plenty of info you could use you make your own templates based off my designs.